In Southern California for my daughter's VB tournament, they finished up a bit earlier on this second day, giving me some extra time to get further afield for some hiking. I wanted to pay a visit to Hoyt Mountain in the San Gabriels, a short distance off the Angeles Crest Hwy. It was the second most prominent peak in the range I had yet to visit, not too far a drive from downtown where I was staying and there were a few other unnamed bonus peaks I could do in conjunction. It took about 45min to reach the parking area at Georges Gap where I would start. The trail here goes off in the wrong direction (downhill to the north), but I would use this to make a loop of my initial outing to Hoyt and nearby Peak 4,253ft. Hoyt Mtn rises above the highway, about 2/3mi west of Georges Gap. A use trail runs up the East Ridge, climbing about 750ft at a fairly steep gradient. A couple of very large cairns are found about halfway up the ridgeline, purpose unknown. A false summit is encountered at the 2/3 point, the whole hike to the summit taking less than half an hour. A register found here dated to only 2014 but already had five pages of entries - pretty busy for a summit that appears on nobody's peak list. Another 3/4mi to the west is the somewhat lower Peak 4,253ft with a saddle dropping 400ft between them. I followed a diminished use trail down the west side of Hoyt Mtn to the saddle in about 15min, finding a line of transmission towers running over it along with the Hoyt Mtn Trail (an old Edison service road) that traverses the north side of the mountain before crossing over the saddle and descending to the Angeles Crest Hwy (this is an alternate route to reach both of these summits). From a distance, it appears that the climb to Peak 4,253ft is a tough bushwhack with brush over head level. A closer look will find an overgrown by quite serviceable use trail that starts off to the right of the transmission tower and climbs steeply to the summit ridgeline. A rusting memorial cross can be found shortly after starting up. The last 500ft along the ridge is a pleasant stroll to the highpoint marked only by a couple of steel survey stakes at the somewhat brushy summit. To the east can be seen Josephine Peak with the Angeles Forest Hwy cutting across its southwest flank, along with some of the higher summits around the Mt. Wilson area. Mt. Lukens rises high to the west with a view into Big Tujunga Canyon to the northwest and north, Mt. Gleason in the background. I returned back down to the saddle and then followed the sometimes brushy Hoyt Mtn Trail around the north side Hoyt Mtn. This is a nice stroll with fine views of Big Tujunga on a little-used trail. After something more than a mile I found an unmarked junction with the Georges Gap Trail (also called the World of Chaparral Trail, according to one sign) and turned right. There is some poison oak to watch out for, but easily avoided. This well-maintained track switchbacks a number of times up to Georges Gap in another mile where I arrived exactly two hours after starting out. As I was sitting in my car fiddling with my GPSr, I noticed a trio of younger folks looking nervously around from inside a nearby car. Once they realized I didn't appear to be driving off anytime soon, they decided to get on with their business which turned out to be some sort of amateur goth princess photo shoot. Of course I took a photo of my own. Isn't this why people come to LA? 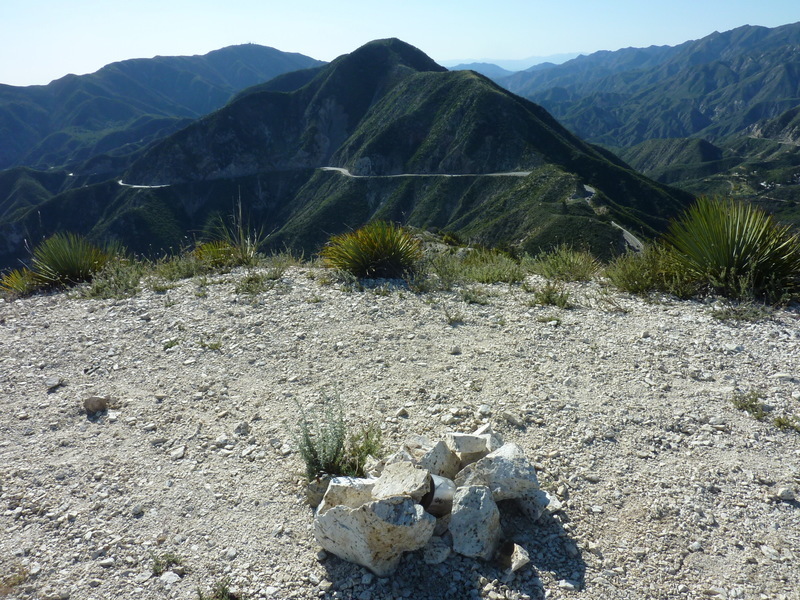 This unnamed summit makes for an easy objective starting from the Clear Creek Information Center (basically a parking lot, bathroom and a couple of kiosks with reading material) at the junction of Angeles Crest and Angeles Forest Hwys. Some fencing was erected behind the bathroom in an effort to keep folks contained to the parking lot, but efforts have not been maintained and there is an easy breach in the defenses found behind the bathroom on the right side. This leads to a use trail, dangerously steep for a short section at the start that soon becomes a tamer, but still stiff climb, rising about 550ft in half a mile. No brush to contend with on this one, and it took just over 15min to reach the top. The summit is open to views in all directions, with a fine view of Hoyt Mtn to the west and Josephine Peak to the north. A register found here also had a stapled set of three pages, a copy of a TR I had written for some Sierra peaks back in 2010. This wasn't the first time I'd found one of my TRs being used for scrap paper at the summit. Amused, I signed my name at the top of the TR, allowing the next person to visit the opportunity to take home the only autographed copy of a Bob Burd TR. Worth a small fortune, no doubt. After descending back down to the Clear Creek Info Center, I drove some miles south on Angeles Forest Hwy to the top of Mill Creek Summit. I was hoping to drive out to Mt Gleason and pay a visit to Messenger Peak, but was denied when I found the gate locked at Mill Creek Summit. Disappointed, I drove back to the Angeles Crest Hwy and headed back towards downtown. I still had about an hour of daylight so I decided to hit up some easier summits around the Pasadena area. This summit is located in the hills of Eagle Rock. Poppy Peak Rd conveniently goes to the top of the hill, or almost. The highpoint is located in someone's backyard just off the street. One might pretend to be a gardener for this upscale home to reach the highest point. An old stately mansion, turned apartment complex, sits atop Grace Hill in the Raymond Hill neighborhood of Pasadena. An interesting two-story tower sits on the property on the north side. There's no parking on the roadway without blocking traffic on the narrow street, but if one were to do so, a short walk from the north would take you by this tower and the highpoint in the back grounds of the mansion. No views unless you can find your way to the second story. A few miles southwest along the 110 freeway gets you to the Ernest E. Debs Regional Park, named for a former County Supervisor. Once called Montecito Park before being rededicated, the park is a large open space natural reserve in the Montecito Heights neighborhood of Los Angeles. The easiest way to reach the highpoint is from the south off Debs Park Rd, but having done no research ahead of time (I simply picked it off my peakbagger app when I ran out of pre-screened peaks after Grace Hill), I chose to approach from the northeast starting from Herman Park. An old road, little used except for a few staying in a homeless camp I ran across, winds it way up from this side. A use trail forking off to the left caught my attention and I used this slightly longer, but more interesting route to find my way to the summit ridge just after sunset. There is a shaded picnic site near the summit and an overlook bench at the highpoint. There is a fine view of downtown Los Angeles about five miles to the southwest.